Lucky Charms was the first cereal to include marshmallow pieces. The first pieces were pink hearts, yellow moons, orange stars, and green clovers. "They're Magically Delicious!" 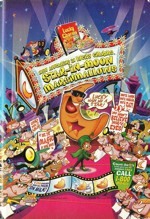 is the most famous slogan attached to Lucky Charms Cereal. The phrase "They're Always After me Lucky Charms" runs a distant second followed by any verbal listing of the marshmallows in the cereal, ie. "pink hearts, yellow moons, orange stars, and green clovers". According to cereal lore, Lucky Charms Cereal was invented when Cheerios were mixed with pieces of Circus Peanut candies. The shapes of the marshmallow pieces (known in the industry as "marbits") were based on the concept of the charm bracelet. When the cereal was first introduced, the oat cereal pieces resembled Cheerios and were not sugar coated. The recipe was changed after initial sales of the cereal were less than stellar. 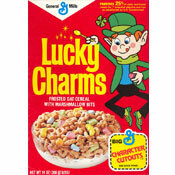 The first TV ad for the cereal introduced viewers to Lucky The Leprechaun and referred to Lucky Charms as a "charming" cereal. Get it? Charm-ing. 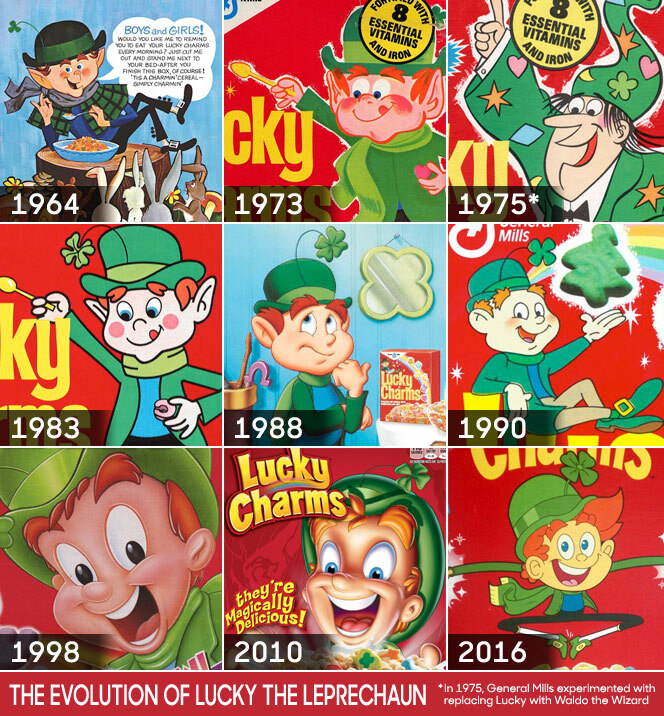 The following image shows the evolution of Lucky the Leprechaun from his introduction in 1964 to his more recent appearance. It also shows Waldo the Wizard - a a possible mascot replacement that General Mills experimented with in limited markets in 1975. As you can see, Lucky survived the challenge from Waldo. These are the most recent images. Click here to see all pictures for Lucky Charms. What do you think of Lucky Charms? 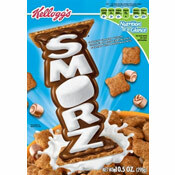 View all 37 comments for this cereal. I Love Lucky Charms. It's a good yummy cereal. Bought 2 boxes of the St. Patrick's Lucky Charms at Wal Mart. Just green clovers but very delicious. My favorite cereal as a kid. The commercials with Lucky were my favorites too. VIVA! When you need it... Lucky charms ROCKS! 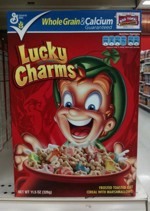 GM has changed Lucky's picture again on the front of the box. Much better picture and closer to the original one. The one that they had been using was scary looking. They really are magically delicious! Lucky charms are so good. Every single day, I want to eat them! I Love Lucky Charms! It's one of my favorite cereals. Although, it used to taste better when I was a kid. I'm pretty sure that they changed the recipe a little.